Tuesday, July 25: The prairie is reaching the period of beak bloom and is very showy with masses of flowering Culver's root Veronicastrum virginicum, Gray-headed Coneflower Ratibida pinnata, Black-eyed Susan Rudbeckia hirta, Bergamot Monarda fistulosa, Flowering Spurge Euphorbia collorata, Dense Blazing Stars Liatris spicata, Virginia Mountain Mint Pycnanthemum virginianum, and Tall Ironweed Vernonia gigantea. Monday, July 10: Saturday's butterfly count attracted 25 participants who recorded 50 species and 1,195 individual butterflies despite overcast conditions for most of the day. Complete results are at naba.htm. Tuesday, July 04: A fresh Pipevine Swallowtail was feeding on milkweed flowers by the nature centre today (PD Pratt). This southern species is very rare in Windsor. Another visitor, Little Sulphur, was found in Spring Garden by Peter Hall. 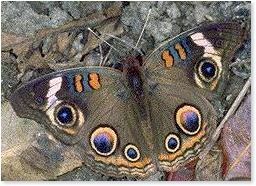 Other southern butterflies seen lately include Buckeye (June 28, A. Wormington, H. O'Neil) and Zebra Swallowtail (at Point Pelee). Giant Swallowtail, Hobomok Skipper and Baltimore are approaching the end of their current flight season while new skippers for the summer include Dion and Broad-winged Skippers (Peter Hall). Good butterfly nectar sources at this time of year include common milkweed, Canada thistle, indian hemp, butterfly milkweed, bergamot, red clover, sweet white clover, colic root, black-eyed susan, common elderberry and buttonbush. Click here for June 2000 sightings.